Well, that was quite an NBA trade deadline day, wasn't it? The Golden State Warriors did nothing because they don't need to mess with what they have. The Boston Celtics were quiet. The Clippers kept DeAndre Jordan. What was truly shocking was not that the Cleveland Cavaliers were active but that they essentially overhauled their entire team outside of LeBron James, the injured Kevin Love and Tristan Thompson (who surely was offered around). Gone are Isaiah Thomas, Jae Crowder, Derrick Rose, Dwyane Wade, Channing Frye, Iman Shumpert and the team's protected 2018 first-round pick - but not that Nets pick. In are the Lakers' Jordan Clarkson and Larry Nance Jr. along with Sacramento's George Hill and Utah's Rodney Hood. Rose was essentially worthless at this point and Wade was solid off the bench but wasn't needed after landing Clarkson, so the Cavs basically did Wade a favor by sending him back to Miami. Thomas clearly wasn't a fit in the Cleveland locker room, was by some statistical measures the worst defensive player in the NBA this century and is a shell of the dominant offensive player he was in 2016-17 with Boston. Crowder is a solid all-around player but just didn't fit for whatever reason. Are the Cavs better now? I think they are (definitely younger), especially Hill over Thomas defensively, but it's going to take a while for all these guys to jell. Are they good enough to beat the Warriors? No. Good enough to win the East? To make LeBron happy enough to stay after this season? TBD. New Orleans was in Philadelphia on Friday. These teams made a worthless trade on Thursday with the Pelicans sending Dante Cunningham to the Nets in exchange for Rashad Vaughn. Yawn. Brooklyn brings a four-game skid into this one after a 115-106 loss in Detroit on Wednesday. Allen Crabbe had a career-high 34 points and rookie Jarrett Allen, who is really emerging of late, had 13 points, 14 rebounds and six assists. D'Angelo Russell had more turnovers (six) than points (four). Caris LeVert (knee, concussion) and Rondae Hollis-Jefferson (groin) were out again. New Orleans beat Brooklyn on Dec. 27, 128-113. Anthony Davis scored a game-high 33 points to go with 11 rebounds, and Rajon Rondo set a team record with 25 assists. LeVert scored a team-high 22 points for the Nets. Key trends: The Nets are 7-0 against the spread in their past seven vs. teams with a winning road record. The "over/under" is 15-3 in the Pelicans' past 18 vs. teams with a losing record. Milwaukee, in Miami on Friday, was quiet at the deadline, while I'm shocked the Magic traded former lottery pick Elfrid Payton, the team's starting point guard, to the Suns for just a second-round pick. Wow. Yes, Payton was due for restricted free agency this summer and can't shoot much, but that's all you get? Orlando is on a season-high-tying three-game winning streak following a 100-98 home win over Atlanta on Thursday. D.J. Augustin, who now is the starting point guard, had 16 points and nine assists. Aaron Gordon (hip flexor) and C Nikola Vucevic (hand) were out but could return Saturday. I'd say the latter has a better chance. The Bucks won the first meeting between the two this season, 110-103 in Milwaukee on Jan. 10. The Magic have won 20 of the last 22 meetings at home, however. Key trends: The Bucks are 1-4 ATS in the past five meetings. The under is 4-1 in those. Early lean: Wait on those Magic guys. 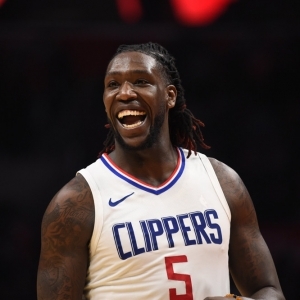 Los Angeles was in Detroit on Friday and Philadelphia home to New Orleans; I wonder if the Clippers simply didn't get a good enough offer for Jordan or opted to keep him once they signed Lou Williams to a contract extension. Now the team risks losing Jordan for nothing this summer but could well make the playoffs. The 76ers didn't make any moves. The Clippers have won 12 of the past 16 in this series but lost 109-105 at home on Nov. 13. Joel Embiid had 32 points and 16 rebounds. Williams had 31 for L.A.
Key trends: The 76ers have covered just one of their past eight in the second of a back-to-back. The under is 5-1 in Philly's past six on Saturday. Early lean: Here we go again. I thought we were done with TBAs in the second of a back-to-back for Philly as Embiid finally played both ends recently and supposedly was going to moving forward. Well, he has a minor ankle injury so your guess is as good as mine as to which end he plays this weekend if either. So aggravating! Washington was hoping to land Jordan but stood pat. The Wizards lost their second in a row Thursday, 110-104 in OT at home to Boston. They couldn't stop Kyrie Irving when it mattered. Otto Porter had 27 points and 11 rebounds for Washington. Chicago, which hosted Minnesota on Friday, took a flier on former lottery pick Noah Vonleh from Portland in a Blazers salary dump. The Bulls lost in D.C. on New Year's Eve, 114-110 in the first meeting. Bradley Beal scored 17 of his 39 points in the fourth quarter. Washington has won four straight in the series. Key trends: The Wizards are 1-4 ATS in the past five meetings. The over is 5-1 in the past six in Chicago. The Lakers were big winners on Thursday. Not because they got Thomas and Frye from Cleveland for Clarkson, Nance and that 2018 first-round pick but because they cleared enough money to now have enough salary-cap room this summer to offer two max contracts - can you say LeBron James and Paul George? The Mavs were in a three-way deal that cost them Devin Harris (no loss there) and landed them Doug McDermott (not much gained there). L.A. enters on a four-game winning streak as it upset the Thunder on Thursday, 106-81. Helped that Russell Westbrook and Carmelo Anthony were out. Presumably, Thomas and Frye will debut here. The Mavs lost their second in a row Thursday, 121-103 at Golden State to conclude a four-game trip. Dirk Nowitzki had 16 points, 11 rebounds, season-high five steals. Harrison Barnes missed his second straight game with a sprained ankle. L.A. won in Dallas on Dec. 13, 107-101, to snap a 14-game losing streak in the series. Prior to that, the Mavericks had not won more than three consecutive regular-season games against the Lakers. Key trends: The Lakers are 2-6 ATS in their past eight in Dallas. The under is 4-1 in the previous five there. Early lean: Wait on Barnes and if Thomas debuts. ABC national TV game with neither team making a move Thursday. The Spurs ended a two-game skid in style on Wednesday with a 129-81 thrashing of the Suns in Phoenix to open the annual "Rodeo Road Trip." It was the third-largest margin of victory in franchise history. There was some bad news as starting point guard Dejounte Murray scored 14 before leaving with a sprained ankle in the second quarter. The Warriors ended their first two-game skid of the season with a 121-103 home win over Dallas on Thursday. Stephen Curry had 20 points, eight assists and seven rebounds. Draymond Green got his 14th technical of the season, meaning he's two away from an automatic one-game suspension. Golden State won in San Antonio way back on Nov. 2 in the first meeting, 112-92. The Spurs did win their final trip to Oakland late last season. Key trends: The Spurs are 0-4 ATS in the past four meetings. The over is 5-1 in the past six. Denver was in Houston on Friday and dealt former lottery pick Emmanuel Mudiay in a three-way deal and only got back Devin Harris. Seems too early to give up on Mudiay, but the Nugs are deep at point guard. Love Phoenix getting Elfrid Payton from the Magic for just a second-round pick. That's a heist. The Suns enter on a four-game skid following a 129-81 home blowout to the Spurs on Wednesday. It matched the worst loss in team history. Phoenix was 3-for-32 on 3-pointers - Payton won't help there. Leading scorer Devin Booker sat again with a hip pointer, Tyson Chandler was out with a sore neck and Tyler Ulis left with back spasms. Ulis just lost his starting job to Payton. It's the last meeting of the season between these teams; they have split two in Denver. Key trends: The Nuggets are 7-1 ATS in the past eight meetings. The over is 5-1 in the previous six. Want $60 worth of member's picks absolutely free? No obligation. No sales people. Get $60 worth of premium members' picks free. Also, for a limited time only get three top NBA handicappers for the price of one! Click Here . Get free NBA basketball picks today at Doc's Sports basketball predictions page .